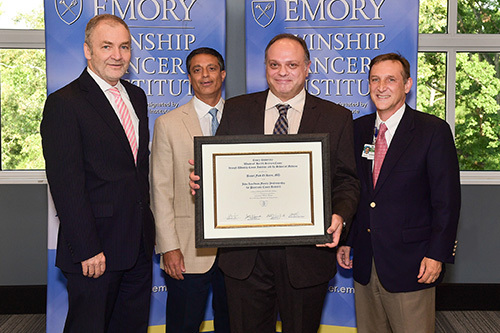 Bassel F. El-Rayes, MD, associate director of clinical research at Winship Cancer Institute of Emory University, was selected to hold the John Kauffman Family Professorship for Pancreatic Cancer Research. The newly endowed position was created to support an outstanding leader in the field of pancreatic cancer research and assist with the further development of Winship’s gastrointestinal (GI) cancer efforts. "Dr. El-Rayes has transformed Winship's approach to patients with pancreatic cancer," says Walter J. Curran, Jr., MD, Winship's executive director. "With this amazing support from the Kauffman family, Dr. El-Rayes and his Winship team are truly positioned to help re-define the natural history of this very difficult cancer." El-Rayes, a professor and vice chair for clinical research in the Department of Hematology and Medical Oncology at Emory University School of Medicine, is the chief clinical research scientist responsible for coordinating and providing high-level direction to the clinical cancer research programs and clinical cancer trials across the Emory campuses. He has also served as director of the GI Program since joining Winship in 2009. Board certified in hematology and medical oncology, El-Rayes is involved in translational research in pancreatic and colorectal cancer. His clinical research focuses on drug development and multidisciplinary approaches to patients with early stage or advanced GI cancer. El-Rayes earned his undergraduate and medical degrees from the American University of Beirut in Lebanon. He completed his internal medicine residency training at Wayne State University in Detroit, Michigan, before joining the school's hematology oncology fellowship program at the Karmanos Cancer Institute. El-Rayes is a reviewer for the Journal of the American Medical Association and Clinical Cancer Research. He serves on the editorial board of Cancer. John Kauffman died of pancreatic cancer in 2013. A longtime president of Atlanta-based Kauffman Tire, he was a strong community advocate for Winship and he served as the inaugural chair of the Winship Advisory Board. The Dunwoody Country Club Champions Golf Association Tournament is held every year in his honor and the proceeds benefit prostate cancer research at Winship. Learn about pancreatic cancer care at Winship.